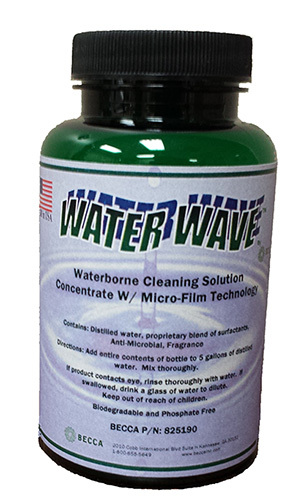 WaterWave™ is a concentrate Cleaning Solution designed specifically for Waterborne materials. Mixed with water and used in a heated state, WaterWave™ will clean the most difficult colors like Red’s & White’s quickly. The Micro-Film™ (No effect to paint materials) coating left from its use will add to the speed of cleaning the Spray Gun. 1. Use WaterWave™ mixed with water (distilled or tap). One bottle makes 5 Gallons of cleaning solution. 2. When heated the WaterWave™ cleaning solution be-comes highly active and speeds up the cleaning process. 3. Very Important! – Complete a detail cleaning of the Spray Gun prior to using WaterWave™ to assure the Micro-Film™ coating will reach all surfaces. Where ever paint is adhered on the Spray Gun the Micro-Film™ will not coat the surface. 4. Equally as Important! – Do not perform a final chase with any product other than WaterWave™. Chasing will remove the Micro-Film™ coating and the enhanced cleaning performance.